Celebrating One Million Plasmids Shared! Can you imagine how much space a million plasmids would fill? Two weeks ago, Addgene edged passed our one million plasmids shared milestone by ending the day with 1,000,002 plasmids shipped. 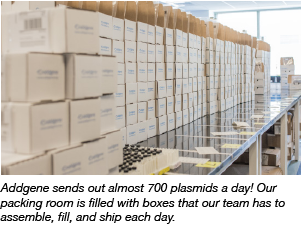 Reaching one million plasmids shared might have you wondering how many plasmids leave Addgene headquarters every day. That would be an average of 673 plasmids each day. This requires tremendous coordination amongst the lab team, shipping team, and others to ensure that everything will ship out in time - from assembling the boxes, to inoculating tubes, and to packing and shipping. Every single day. 673 plasmids shipped daily may be easy to picture (see the picture of our shipping room above), but as Joanne Kamens, Addgene’s executive director, said during our celebratory lunch, it’s hard to picture one million plasmids. How much space would one million bacterial stabs take up? If 81 vials fit into one freezer box, one million stabs would take up over 12,000 freezer boxes, enough to fill thirty -80°C freezers (assuming 400 boxes fit in a freezer). This massive scale reagent sharing led us to calculate how much time we have saved researchers. In a recent blog post, we looked at how long it takes to make one plasmid and how much time Addgene has saved researchers. Assuming 5 hours of hands-on time to make each plasmid, we would have saved 5 million hours through reagent sharing. How much is 5 million hours? A colossal 547 years! While we are very excited about reaching this milestone, it wouldn’t have been possible without the scientists who deposited plasmids to the repository and for the scientific sharing community (check out the infographic below for stats on our plasmid deposits and requests). Over the past month, we’ve enjoyed seeing scientists sharing their contributions on social media as well the excitement amongst our Addgenies on social media or around the office. 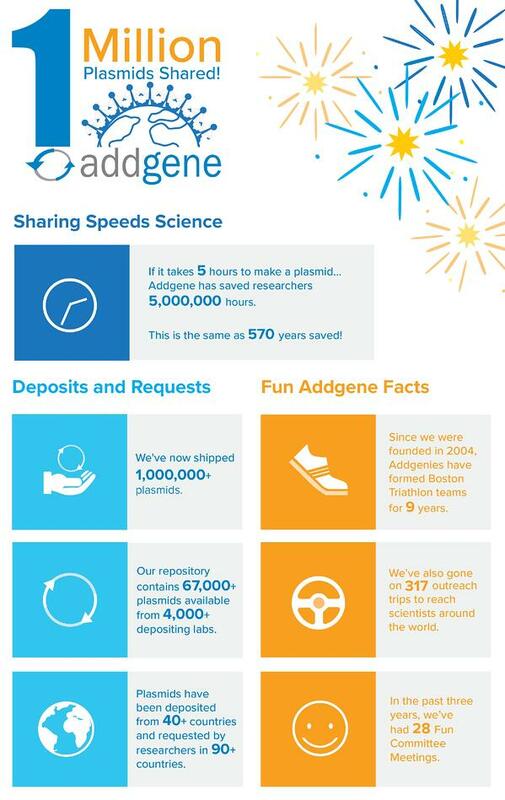 @Addgene congrats for 1 million orders. @RothLabUNC accounts for 10,000 or 1%! As Addgene grows, we have been able to adapt to the needs of the scientific community. For example, we started a new service distributing ready-to-use viral preps in 2016 and we just reached our 10,000th viral vector shipped! In the upcoming months, we will be moving into a bigger space so that we can make an even bigger impact - we are always on the lookout for new ways to help researchers facilitate and accelerate scientific discovery. How can Addgene help accelerate your research? Let us know!